A very challenging wooden puzzle for kids who are patient and love a challenge. Get a good look at it before you take it apart! A fully-guaranteed kids wood puzzle that comes with a Name Puzzle coupon good for your next Name Puzzle order! 30 pieces. Ages 6 and up. If you are looking for a challenging puzzle that can keep your little one engaged instead of frustrated, then look no further. 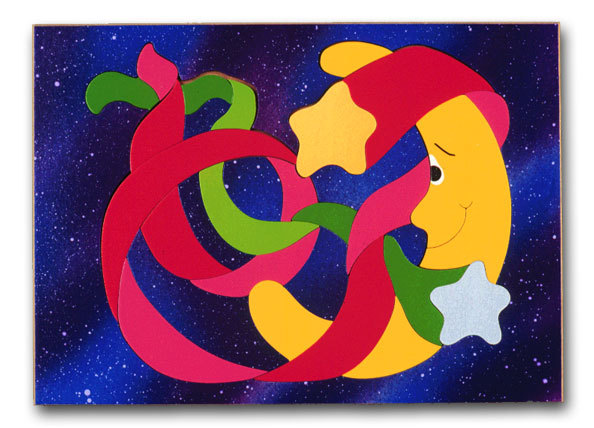 Our moon and star puzzle might seem easy, but is more difficult than meets the eye. 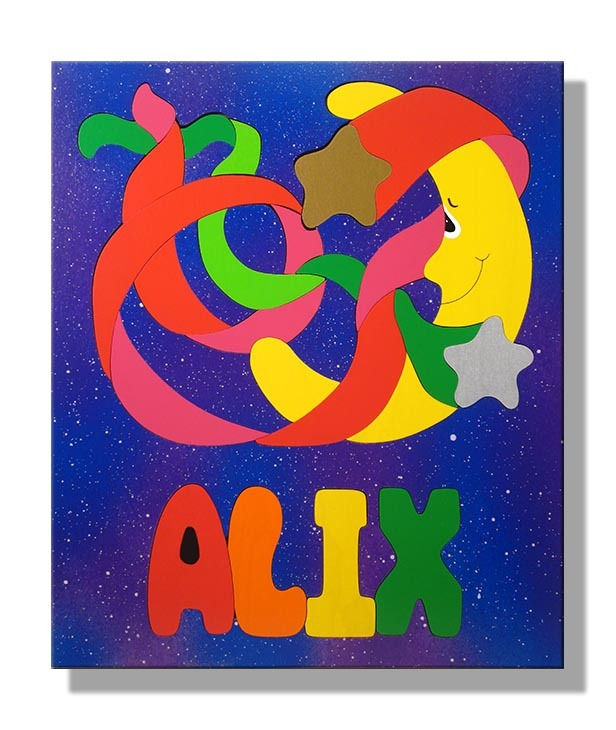 Whether your young child is ready for a new challenge, or loves outer space, this moon and star puzzle is the perfect gift. We think that your kindergarten or elementary school child will be up for the challenge that this colorful puzzle offers. Our moon, stars, and weaving ribbon seems easy at first glance, but be sure to take a good look at it before you take it apart! Your child will work on their critical-thinking and problem-solving skills as he puts the pieces together. Watch your child’s emotional intelligence and focus develop while putting the pieces in just the right place. You will be pleasantly surprised as you watch your little astronaut put this puzzle together. As with all of our designs, the moon and star puzzle is hand-cut and painted in our Oregon shop. We use only nontoxic and lead-free paints and materials, and each of our puzzles is built to last for generations of play time. Order your puzzle today and we create it in our shop. Plus, if you order now, we will include a coupon that will make your next Kid Puzzles Name Puzzle order extra special.